A comprehensive video training pragramme presented by Selwyn Hughes and Trevor J. Partridge. This convenient and powerful resource includes teaching, role-playing, interviews, drama and testimonies. The course has been designed for use within small groups. 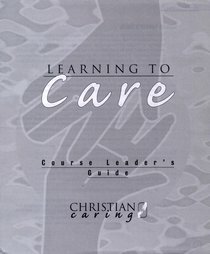 About "Caring God's Way (Leader's Guide)"
Selwyn Hughes died on 9 January 2006 ending a ministry that spanned more than four decades, in which he uniquely combined the roles of writer, pastor, counsellor and teacher. He also founded CWR (Crusade for World Revival), an international organisation that has spearheaded the training of Christian counsellors, leaders and workers and that continues to produce Christian resources, including the bestselling dated devotional Every Day with Jesus. Selwyn also authored dozens of other bestselling books, including Christ Empowered Living, The 7 Laws of Spiritual Success and his autobiography My Story. Trevor J. Partridge is Associate Senior Pastor of Greenlane Christian Centre in South Aucland, New Zealand. For 24 years he was involved with CWR and the Every Day with Jesus ministry, where he developed Waverley Abbey House and its training programmes. He is the author of the Caring God's Way workbook and seminars, and quite a number of the Cover to Cover series.